Left-Handed Can Opener with Orange handles. This left-handed can-opener is designed to be held in the right hand, while turning the knob counter-clockwise, the natural direction for a lefty. Right-handed can openers are troublesome and unsafe for lefties. Left-handed can openers are our most popular kitchen tool! Stylish orange plastic handles and turning knob, with an overall length of 8". Includes a bottle opener slot at the top. 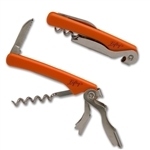 Purchase together with the Orange Lefty's Left-handed Corkscrew for a great gift set. This opener is made to fit on the left side of the can and go around the can counter-clockwise. The knob is turned with the lefty's stronger left hand, much more natural and safe for lefties to use. It's WONDERFUL to have a new one (they don't last forever). And it operates s - o - o smoothly! All the can openers called left hand on the internet looked suspiciously like regular right handed. This one is very sharp. Better than our electric can opener. Nice to be able to buy regular cans instead of only the pull top types. Was a little tricky to learn how to use it. I had to have this replaced because when I opened it, the handle was broken. I had sent photos of the damaged item and a new one was sent to me.